Service providers can build a business from their service, skill and expertise; they can also leverage their time, energy, impact, and income by developing a service based business model for growth and online courses, products, and programs. Service professionals are a special breed of people who truly love to serve and if there is one thing I have learned from being a heart centered service provider, it is that as much as we serve, we also can make a great living and lifestyle at the same time! I know, I know, us servers just love what we do and we do not do it for the money. Of course not and that intent and way of being will always be there. However, the world needs us to keep serving and serve on a larger scale and we cannot keep doing that if we are limited in our time, energy, and income. The impact we can make is directly related to the amount of time, energy, and income we make. My purpose and passion is empowering, educating, and elevating service professionals, service based business, and aspiring service entrepreneurs to leverage their time, energy, impact, and income! You, yes you, deserve to receive as much as you give on a daily basis and yes heart centered service providers can have both fulfillment and a full bank account. That’s my mission to show you how you can build a profitable business from your service, your skill, and your expertise. In this video, I share with you my story and evolution going from a stuck service professional limited in the income, energy, and time I had to developing workshops, creating online courses, and developing online educational products. My service and expertise went from serving a small community to now travelling the globe helping people and sharing my knowledge on a much larger scale. 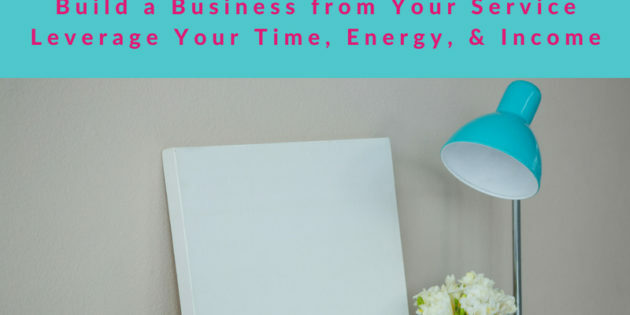 How do you take your service and leverage it into a business that will give you the opportunity to make more money, a greater impact, and save you time and energy? I know it sounds like a dream, but it isn’t and after fifteen years of being tired and limited in the income I could make, I discovered the way and want to share it with all of you! There are many ways you can build a business from your service that leverages you, your time, and both income and impact. Here are a few of the options I have used and brought me long term, passive, and leveraged income. Workshops where you can either train the trainer or teach on a specific topic. This leverages how much you can make in a day because it is the same amount of time for you, but you are charging by the person and to a group of people. Online products which can be a variety of formats. I chose an eBook and video package format and offered it to a niche group which has worked really well and brought me income since 2009 when I created them. Online courses which allow you to share your expertise and knowledge in a course format and there are multiple platforms which make it super easy to just upload your content and deliver the course. If you already teach, train, or coach and want to develop this into a course, this is a great option. So how can we build both lifestyle and income freedom from our service? So glad you asked because I did not know this answer either nine years ago when I leaped into the unknown of entrepreneurship. If someone had told me that I could take the service that I was, at the time, being paid hourly for and turn it into a passive income stream online and also a leveraged workshop being paid more in one day than I made in a month, I would have doubted the reality of it. Maybe that seems pessimistic, but it was so far out of my trading time for money mentality and my circumstances at the time, that I could not have even envisioned what was possible for me and now for you too! Here’s how your service can be transformed from hourly to passive and to time and income leveraged with workshops. If you create an online product, you develop it once and then every time it is sold, you make money. So in essence you do the work once, you market it, and pretty quick the time you put into creating it is paid off and all additional sales are profit with only minimal marketing upkeep. If you offer online courses, you can now reach people around the world not just your corner of the world, and you basically create and teach the content once while getting paid over time for all course sales. There is marketing involved and content marketing to promote it and get it seen, but it is all worth the rewards it will bring you! If you offer workshops or live training, your time is leveraged because rather than one person paying you for that time, you now have a group paying you and multiple people paying for the same amount of time. It is not only a benefit for the participant because the rates are usually affordable, but also for you being paid a group rate. If you offer this online, you also save on the room rental fees. As you can see there are so many options to scale, grow, leverage, and monetize your service based business. Watch the video below to hear my story, the evolution of how I took a niche service and expertise I had and grew it into an online business and one day workshop that has brought me income for a decade now! To learn how you can grow your service into a business that leverages time and income or how to develop an online business with courses and products, contact Jody at jody@jodykennett.ca.